Guest blog post by Dr. Cody Friesen, founder and president of Fluidic Energy, an associate professor at Arizona State University and a member of the U.S.Manufacturing Council. As the founder of Fluidic Energy and a member of the Department of Commerce’sManufacturing Council, I’m always mindful of the state of the economy. It’s impossible not to notice the beneficial impact of trade, and the importance of manufacturing, to the continued growth of U.S. exports. The Manufacturing Council exists to advise Commerce leadership on the best policies to support manufacturing and U.S. exports.As great as exporting sounds in theory, the barriers to exporting can seem high to many small or medium-sized companies, but that’s really not the case. I had the privilege of joining Acting Secretary of Commerce Rebecca Blank and 19 other American companies on a trade mission to Latin America, discussing infrastructure development in the region. We were able to meet one-on-one with government officials and foreign company executives who will be shaping the growing infrastructure of these growing economies. We made crucial contacts and learned the critical facts in each country that will help us to maximize the opportunities for our company in the region. The Department of Commerce was instrumental in pulling together the meetings most meaningful to Fluidic. TheGold Key Matching Service and the local International Trade Administration staff, especially the U.S. Commercial Service personnel, in each country made it possible to rapidly assess potential business opportunities. Gold Key is a truly remarkable, and perhaps underutilized, service available to any company looking to potentially enter any of the 72 countries in which ITA has a presence. I can’t speak highly enough of the committed staff with whom we worked in the run up to the mission, and their attentiveness to our business needs once in country. Fluidic Energy now has the facts, the contacts, and the industry awareness to make sure we can compete as these regions develop the next generation of their energy infrastructure. So how’d we do it? Simple: we applied. The Department of Commerce’s International Trade Administration leads missions like this regularly. You just find the industry and the region most suited for your business. Then you apply. Then you export. As we export, we support the economic recovery. We prove that in the face of a global supply chain and a global customer base that U.S. manufacturing is far from dead. We also advance the U.S. knowledge economy, provide protection for our businesses against economic downturns, and we help foreign companies and consumers around the world understand that nothing beats the products made by American companies. I’d like to thank the Acting Secretary, who is just about to return to academia (yeah! ), for leading this mission. She is one of those rare people who find themselves in important roles yet remain remarkably gracious while navigating what most certainly is a highly demanding role. I wish her all the best in her new role. If you aren’t exporting because you think the barrier to entry is too high, you’re missing out. I hope more of my advanced technology and manufacturing colleagues in the U.S. get on board. The world wants what we have to offer. Remember, “Sine labore nihil”–without labor nothing. Guest blog post: Developing Foreign Business is Easier than You Think | Department of Commerce. Is America really terrible at globalization? I disagree with this post, but I feel that it merits discussion. What are your opinions? Re-blogged from qz.com courtesy of Ray Hays, Member of Arizona District Export Council. Coke is so prevalent around the world that non-profits look to its supply chain for help on distributing aid. McDonalds, in 122 different countries, is so widespread that there’s a foreign relations theory that no two countries hosting the burger franchise will go to war, although the strong version of that theory is well dead. And Wal-Mart is the world’s third largest global employer, after the American and Chinese militaries, respectively. The US must be great at globalization, right? In 2010, emerging markets represented 36% of global GDP; these markets already account for the majority of the world’s oil and steel consumption, 46% of world retail sales, 52% of all purchases of motor vehicles and 82% of mobile phone subscriptions. With two-thirds of global growth coming from these markets, in a decade they will account for the majority of the world’s economic value. Yet U.S. companies derived less than 10% of their overall revenues from emerging markets: about as little as 7%, according to HSBC estimates for 2010. The 100 largest companies from the developed world overall made 17% of their revenues from emerging markets, according to a McKinsey report; in other words, the U.S. lags not only emerging market firms in capturing share in emerging markets, but it lags the developed world overall. By considering the difference between the “absolute potential” represented by the 36% number or, to take a much more conservative benchmark, the global peer average of 17% and the U.S. share of 7%, we derive two measures of the gap – and the degree to which U.S. industry has not participated in global growth. There are several reasons the US is being held back. Some are the intrinsic challenges of doing business abroad: Besides language and cultural barriers, there are underdeveloped supply chains, incomplete capital markets, corruption, etc. But European companies earn 25% of their revenues from emerging markets, so these must be surmountable. What’s America’s problem? America is actually pretty insular. Because it’s a big country, and has had many decades of consumer-driven growth, US businesses haven’t necessarily had to look over the horizon for new opportunities. After the 9/11 attacks, Chakravorti says, things got even worse, and most businesses stayed home. It doesn’t help that less than 20% of Americans speak a language other than English, while 56% of Europeans speak a second language. American business is all about standardization. Companies get economies of scale from selling the same product, but many emerging markets are stratified and require different products and price-points in the same country; while American executives want a ”Brazil strategy,” what they really need is a strategy for Sao Paulo state and another for more rural areas. Chakravorti argues that American companies do have what it takes to surmount these challenges, and they’ll need to if they want to bring more growth back to the US. His strategy starts with a focus on sectors where America can compete abroad but isn’t taking full advantage of the opportunities, particularly in consumer products and large-scale services such as education, elder- and child-care. American companies need to start thinking about tailoring their strategies to demand abroad—particularly at the bottom of the pyramid— but the market can’t do it alone: The government needs to work more closely to tailor its foreign policy to America’s commercial needs while opening education to a more international view. Francisco Sánchez serves as the Under Secretary of Commerce for International Trade. During the last several weeks, we’ve highlighted a lot of great news in the business of U.S. exports. From record exports in travel and tourism tosuccesses in gaining access for American companies to foreign markets, 2012 gave us a lot to be proud of in the field of exports. More important than just the dollar amounts is the fact that almost 10 million jobs were supported by these exports in 2012. This success is the direct result of a concentrated initiative introduced by President Obama in 2010, one that has coordinated the efforts of several U.S. government agencies to increase American exports and create American jobs. Under the National Export Initiative (NEI), we’ve seen U.S. exports increase from $1.58 trillion in 2009, to a record $2.2 trillion in 2012. We recognize the third anniversary of the NEI this week, so we’ll be sharing some of the successes we’ve seen under this initiative over the next several days. I hope you will get in on the conversation. How have exports helped your business? How can the International Trade Administration and other government agencies help you increase exports? Follow some of America’s core export-promotion agencies on this Twitter list to learn about the government’s efforts to help U.S. business. As always, ITA is here to help any U.S. company looking to create or increase exports. It all starts with a visit to one of our Export Assistance Centers or to export.gov. Could franchising be the future of Australian Medical Care? When you think of healthcare, franchising does not immediately come to mind. Drive through clinics? Franchised hospitals? Not likely, but the home healthcare and medical staffing sector is ripe for franchise growth. One highly awarded U.S. franchise company, BrightStar Care, proved that quality home healthcare and medical staffing works very well as a franchised concept. BrightStar’s proof is in the numbers. With a 3-year revenue growth rate of 433%, BrightStar is the most successful medical franchise in the U.S. BrightStar Care was ranked in the Inc. 500 list of fastest-growing private American companies from 2009 to 2011, and it is currently ranked #54 of the fastest-growing private U.S. health sector companies. 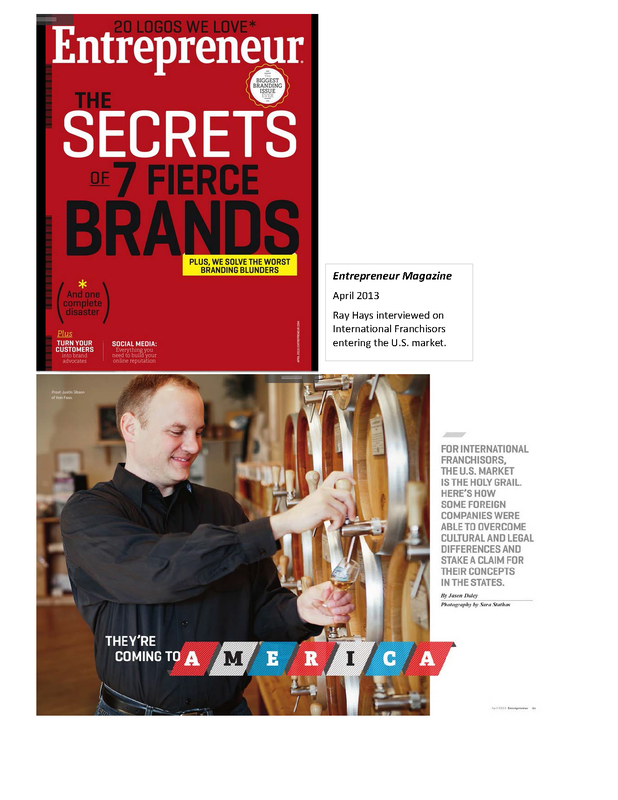 With a field of thousands of U.S. franchise concepts, Entrepreneur Magazine ranked BrightStar Care #21 in their list of the Fastest-Growing Franchises for 2012. Franchises are not new in the care sector. Over the last decade, multiple countries have experienced a boom in non-medical care franchises. However, non-medical services by definition do not cross the line into licensed medical care. This is where BrightStar Care broke the mold. BrightStar has about 250 agencies that offer a range of services, including medical staffing, home healthcare/ home nursing, as well as non-medical care at home. Among home healthcare and medical staffing services, BrightStar is the first to successfully franchise these services on a national scale. By comparison, non-franchised home healthcare or medical staffing companies tend to remain confined to local or regional markets without the national scalability and rapid time-to-market that the BrightStar franchise offers. Of course, Australia and U.S. healthcare markets differ in many ways. To become a successful player in Australia, BrightStar clearly understands that it will need to adapt its business model to fit the Australia market. For this reason, BrightStar is seeking a Master Licensee, who brings the local healthcare sector know-how and market experience to localize the business model and build a true Australia brand leader. BrightStar’s Master Licensee in Australia will have the flexibility to open Master-owned locations or sell franchises into select markets. Depending on the Master Licensee’s expansion strategy, the total capital required will be in the range of AUD $500,000 to $1,000,000. By Ray Hays, International Consultant and Member of the Arizona District Export Council. Re-blogging of this post is permitted and encouraged. As many U.S. small and medium-sized enterprises (SMEs) compete for revenue from new markets, they often overlook the global picture: Promote your products and services internationally. While it sounds daunting, it’s often a simple matter of funding and international expertise to sell your products and services into global markets. What if your company had the opportunity to leverage international business experts from the public and private sector to market your product internationally? At no cost? Welcome to the best kept public secret in international business. The rules and amounts of the grants will vary by state, but in many cases, U.S. exporters of products and services are eligible for thousands of dollars in export promotion grants. Trade Missions – These are usually managed through the individual state trade agencies or through federal agencies, such as the U.S. Commercial Service. These trade missions typically gather attendees from a sector to participate in a multi-country promotional visit, supported by the the Trade Representatives at U.S. Embassies in those countries. Trade Shows and Fairs – Similar to the trade missions, your state and federal agencies may attend a industry-specific Trade Show, with U.S. small businesses representatives. Individual Company Promotion Events – Through the U.S. Commercial Service and other organizations, U.S. businesses have the opportunity to have a custom program that helps the American company to identify buyers, distributors, licensees or other partners in key international markets. These programs (such as the USCS Gold Key Program) typically leverage the resources of the U.S. embassies and consulates in the international markets. Privately Contracted Export Marketing and Promotion — A range of U.S. companies work closely with the USCS and other agencies to provide contracted export assistance to SMEs. Often these private contractors supplement existing U.S. government programs, providing small businesses with the management guidance and experience to maximize their success in their export marketing efforts. As a (very rough) example, a Trade Show may require a travel budget of $5,000 and exhibition costs of $5,000. Some U.S. companies can qualify for reimbursement of 75% or more of the travel cost and 100% of the exhibition costs through the STEP Grant program. This would bring the cost of a $10K trade show into the range of $1,250… Other export promotion activities may be covered in-full. Of course, a U.S. company should not strike out blindly into the international marketplace. Your company will need to identify target markets, evaluate risk/returns based on the country regulations and demographics, build a model for international expansion and finally, execute on this plan. If you do not have the international expertise in-house, you can work with a U.S. contractor — a consultant or management firm — to plan and deploy the export promotion strategy. Whether your company builds an international team in-house or contracts international management specialists, this would be a good time to take action. The second year of SBA STEP Grants are already awarded, and the third (and final) year of STEP Grants are awaiting proposals. Go get your piece of the international pie. In addition to these grants, export financing programs for SMEs are available through SBA and Overseas Private Investment Corporation (OPIC). For resources, please contact your regional District Export Council (Google it for your state), or the nearest U.S. Commercial Service Export Assistance Center. Having personally participated in over 40 international events and trade missions through the USCS, I highly recommend using their services. I am currently a Member of the District Export Council in my home state of Arizona, which works closely with the USCS on export promotion efforts. Regardless of your location, please feel free to contact me if you would like more information on these programs, and I would be happy to point you to the appropriate export assistance resource in your local market. This article is based on current knowledge to-date of STEP Grants based on various government websites. The program details may vary by state and rules are often updated. For the latest information please click on this link for the SBA website page on the STEP Grants. Please re-blog or re-post this article to your social media groups and professional contacts interested in international business. Copyright Ray Hays, Envoy Investments LLC. All rights reserved. Re-blogging of this post is permitted. Referrals to http://www.rayhays.com are appreciated. Ray Hays owns Envoy Consulting, which provides international business development guidance for U.S. product and service exporters. Ray is a Member of the Arizona District Export Council. Email: ray@rayhays.com, cell: 714-797-3386, Skype: Ray_Hays. Todd DeLelle is an international trade specialist in the International Trade Administration’s Office of Energy and Environmental Industries. Commerce Department and the Environmental Protection Agency (EPA) officials will be participating in a series of collaborative activities to promote exports of U.S. environmental solutions during POWER-GEN International, the industry leader in providing comprehensive coverage of the trends, technologies and issues facing the generation sector. At this year’s show, EPA participation has been folded into the International Buyer Program, a joint U.S. government-industry effort designed to stimulate U.S. exports by promoting U.S. industry exhibitors to foreign markets. Department of Commerce and EPA representatives are meeting with power industry delegates from international markets and U.S. companies at the show’s Global Business Center. The Department of Commerce and EPA continue to work together to promote U.S. technology exports by integrating EPA’s technical analysis into Commerce’s export promotion and trade policy activities. The two agencies lead The Environmental Export Initiative – an effort to enhance interagency efforts to support U.S. exports of technologies relevant to air emissions, water treatment, and solid waste management. The Initiative was publicly announced on May 14, 2012 at American University by then-Commerce Secretary Bryson, EPA Administrator Jackson, U.S. Trade Representative Kirk, and Secretary of Agriculture Vilsak. In 2010, the United States industry that supplies these goods and services generated an estimated $312 billion in revenue, employed 1.7 million Americans, and experienced a trade surplus of approximately $13 billion, according to Environmental Business International. Its export activities underpin the advancement of environmental quality and human health in other parts of the world, while supporting increased jobs and economic activity in the United States. While at the show, Commerce and EPA officials will be touting the recently developed Environmental Solutions Exporter Portal. The portal represents a on-line resource for companies interested in U.S. government services and products that facilitate exports. It provides a direct line to U.S. trade and environmental protection specialists and includes information on foreign environmental markets, export facilitation services, export finance products, trade promotion events, and policy initiatives that support the U.S. technology exports. The Portal also links EPA analysis of key global environmental issues with U.S. solutions providers in the U.S. Environmental Solutions Toolkit. Currently, the Toolkit includes modules on groundwater remediation, nutrient removal in municipal water treatment, emissions control from large marine diesel engines, and mercury control from power plant emissions. The addition of supplemental air pollution control areas is currently underway, including those relevant to: nitrogen oxides emissions control from power plants, air issues relevant to the oil and gas industry, and emissions from non-road diesel engines. For more information, including how companies can participate, please visit the portal at www.export.gov/envirotech or www.epa.gov/international/exports. Article Re-blogged from International Trade Administration, courtesy of Ray Hays, Member – Arizona District Export Council. David Moore is an economist in the Office of Trade and Industry Information within the International Trade Administration. This week the International Trade Administration’s Office of Trade and Industry Information released an annual update to its website for the U.S. Commerce Department’s Exporter Database (EDB) for 2010. This joint project with the U.S. Census Bureau’s Foreign Trade Division is the cornerstone of ITA’s Trade Data Enhancement Initiative, the goal of which is to develop and disseminate improved statistical information on U.S. international trade and its role in the U.S. economy. Additional information on the EDB can be obtained by viewing the U.S. Census Bureau’s Profile of U.S. Exporting Companies, 2009-2010. In 2010, more than 293,000 U.S. companies exported goods, up 6.0 percent from the revised 2009 estimate of 276,600. In 2010, nearly 98 percent of U.S. exporters (286,661) were small or medium-sized companies (SMEs*) with fewer than 500 employees, a 6.1 percent increase over 2009. Further, the known merchandise export value of SMEs rose to $383.4 billion in 2010, up 24.1 percent from 2009 and this accounted for 33.7 percent of the $1,138 billion total known merchandise export value of all companies. SME exports are concentrated in the largest exporting states, with the top four exporting more than $30 billion from SMEs. California had the largest value of SME exports ($68.1 billion) in 2010, followed by Texas ($51.2 billion), New York ($34.4 billion), and Florida ($33.6 billion). Note: SME values for Vermont are unavailable for 2010. 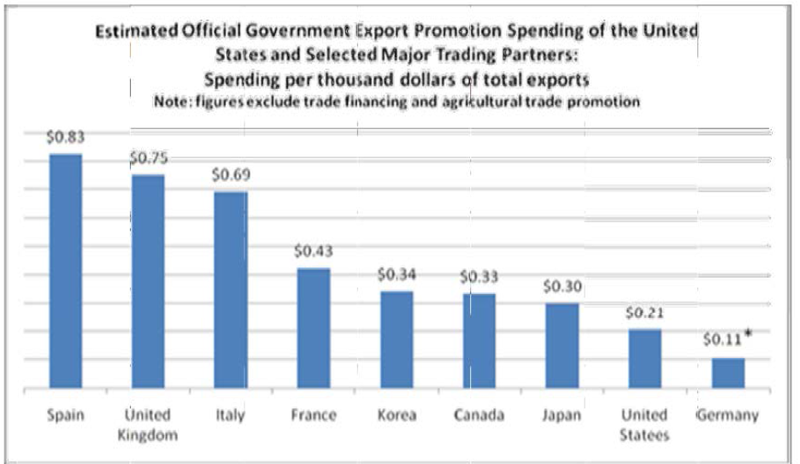 However, SME exporters represent a large share of the value of U.S. exports in both small and large states. 79 percent of Montana’s exports in 2010 were from SMEs, the highest share in the nation. Florida, Rhode Island, Wyoming, and New York all had an SME share of exports over 50% as well. The New York metro area had the largest number of known SME exporters at 32,300, followed closely by Los Angles (32,100), Miami (26,300), Chicago (13,300), and Houston (10,500). Further world destination break-outs by the European Union-27, NAFTA, ASEAN, and DR-CAFTA are shown below. Other country groupings such as APEC and OPEC can also be accessed using the EDB website. Of the 25,754 zip-codes in the U.S. reporting at least one SME exporter, nine of these zip-codes reported one thousand or more SME exporters. Miami had the largest concentration in five zip codes (33166, 33172, 33178, 33122, 33126), followed by New York in three zip codes (10036, 10018 and 10001) and Los Angeles in one (90021). Further, 673 zip-codes reported between 100 – 923 known SME exporters, while the remaining balance of zip codes reported between 1 and 99. In closing, the EDB offers a whole host of information on U.S. exporters, not only by company size and type (manufacturers, wholesalers and other non-manufacturing firms) but also by 3 and 4 digit NAICS product codes, and export country destination, etc. This is just a small slice of EDB data available on our website, but we encourage U.S. companies and professionals working in global trade, policy, cooperation and promotion to utilize this snap-shot of 2010 as they continue to map out their strategies for export success in the future. *SMEs are defined as firms that have fewer than 500 employees. All figures in this overview include only identifiable or “known” exports, i.e., exports that can be linked to individual companies using information on U.S. export declarations. If you are a small business interested in exporting, this is an invaluable resource. Yuki Fujiyama, a trade finance specialist with the Office of Financial Services Industries in the International Trade Administration, is the author of The Trade Finance Guide: A Quick Reference for U.S. Exporters. What is the Trade Finance Guide?